Pulmonary physicians, also known as pulmonologists, are internists that focuses on disorders of the respiratory tract. Pulmonologists deal with diseases and conditions that affect the lungs, focusing on their causes and prevention. They diagnose and treat patients and manage chronic diseases. 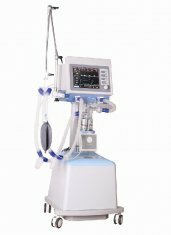 Pulmonologists also manage mechanical ventilation for patients who need life support. Training in pulmonologists entails a two year fellowship following residency in internal medicine. Many physicians choose to study critical care medicine or sleep medicine in conjunction with pulmonology. Patients are typically referred to a pulmonologist for evaluation if they are breathless, wheeze, have a persistent cough or experience tightness in their chests. Often, an abnormal chest x-ray or scan will lead a patient to consult a pulmonologist. Diagnostic procedures used in pulmonary medicine include measurement of gases in the arterial blood and spirometry, which is used to measure lung volumes. Imaging techniques such as chest x-rays, CT scans, scintigraphy and PET scans may be used as well. Pulmonologists may use bronchoscopy to directly examine the condition of the lungs. Sleep studies are essential for identifying and diagnosing sleep apnea. Common pulmonary conditions include hereditary diseases, such as cystic fibrosis; diseases and conditions such as lung cancer, emphysema, chronic bronchitis and asbestosis that result from exposure to toxins including tobacco smoke, asbestos, exhaust fumes and coal dust and fumes; autoimmune diseases and processes that result in pulmonary fibrosis or pulmonary hypertension; and infectious diseases such as pneumonia and pulmonary tuberculosis. Many pulmonologists and pediatric pulmonologists treat patients with asthma, a chronic inflammatory disease in which bronchial airways narrow excessively, resulting in difficulty in breathing, coughing and wheezing and in extreme cases, possibly in death. Asthma attacks may be triggered by dust, pollen or even cold air. Obstructive sleep apnea is a pulmonary disorder in which a functional obstruction of the upper airway results in apneas—repetitive pauses in breathing—and sleep disruption. Sleep apnea is commonly associated with obesity and symptoms include loud snoring and daytime sleepiness. Pulmonary hypertension is abnormally high blood pressure in the pulmonary arteries, which bring blood to the lungs. It is often associated with congestive heart failure, malfunction of the heart valves and congenital heart disease, although it may be associated with many other lung disorders as well. Pulmonary medicine is very important especially to help treat those with asthma.